JERUSALEM/KAMPALA, 16 April 2015 (IRIN) - For Eritrean and Sudanese asylum-seekers facing deportation from Israel’s Holot detention centre, the future is bleak. Those who have gone before describe a hand-to-mouth existence in Uganda or no freedom of movement in Rwanda. Israel has been encouraging asylum-seekers to leave the country for the past year by offering them one-off grants of $3,500 and one-way tickets home or to “safe” third countries in Africa. At the end of March, Interior Minister Gilad Erdan gave asylum-seekers 30 days to return to their own countries or accept “voluntary” deportation. Refusal to do either will result in a hearing followed by possible indefinite detention in a prison for irregular migrants called Sa'aronim. In the past year, about 7,000 have opted to return home, while 1,500 accepted so-called voluntary deportation to third countries, according to immigration figures. Although the government has not named the third countries being used for deportations, testimonies gathered from deportees suggest they are Uganda and Rwanda. “Life was hard in Israel. We were confined in the detention centre; we couldn’t move. Our only work was to eat and sleep,” said Mekonen, recalling his decision to go to Rwanda. Miki Bereket, another Eritrean asylum-seeker deported last July, said the group was originally offered two options before being told it had to be Rwanda. “When we reached there, we realized we were not wanted in Rwanda either,” he told IRIN. Rwandan President Paul Kagame is reported to have confirmed that a deal with Israel to accept some of its unwanted asylum-seekers is imminent. However, the Hotline for Refugees and Migrant Workers spoke with asylum-seekers already sent to both Rwanda and Uganda. Reut Michaeli, the hotline’s executive director, said their testimonies showed neither Uganda nor Rwanda should be considered “safe” countries. After two weeks in Rwanda, immigration officials gave the Eritreans temporary travel documents allowing them to move on. Some headed for Sudan and Libya, in the hope of reaching Europe, but Mekonen and Bereket decided to try their luck in Uganda, where they applied for asylum. The $3,500 grants they received from the Israeli authorities are all spent and their status as asylum seekers prevents them from working. “We have to survive on one meal a day. Some days, we don’t have anything to eat,” said Bereket. “I have managed to get a girlfriend as part of the survival strategy. At least I know I will get some food to eat. Despite the struggle to survive in Uganda, Mekonen said life was “fairer” than in Israel or Rwanda. “At least I am free,” he told IRIN. "I will choose indefinite prison"
For other Eritrean and Sudanese asylum-seekers still in Israel even the prospect of indefinite detention is preferable to the uncertainty of deportation to a third country. Aman Beyene, 38, said his friend regretted having accepted voluntary removal to Uganda in May 2014. According to Beyene, when his friend arrived in Uganda, police were waiting for him at the airport. After four hours of questioning, all of his paperwork was taken from him. "He went to a UNHCR office and told them about his situation and was told they couldn't accept him because he'd voluntarily left Israel. He's in hiding now, with no work, no way to feed himself and if he's found he will be arrested." Beyene fears a similar fate. He left Eritrea in 2008 after being imprisoned and tortured for rejecting military service. His request for asylum in Israel was turned down last year and he has been at Holot, an “open” facility in Israel’s southern Negev desert, ever since. "I will go anywhere that Israel can guarantee I will be protected, but until then I will choose indefinite prison over Rwanda or Uganda," Beyene told IRIN. 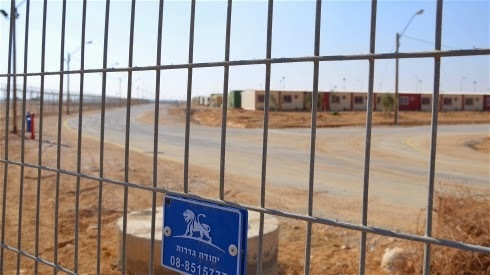 Holot was built after a 2013 Supreme Court ruling that incarcerating migrants at Sa'aronim without trial for up to three years was unlawful. The court ordered that migrants and asylum seekers detained in Sa'aronim and Ktziot prisons should be released within 90 days. The government responded by passing a law that reduced the period of detention to one year but allowed for indefinite detention in an “open” detention facility. The continued used of indefinite detention caused Israel’s High Court to order Holot be shut down last September. The government then amended the law, limiting detention at Holot to 20 months. Michaeli of the Hotline for Refugees and Migrant Workers said the new policy of “voluntary” deportation appeared to be a way of circumventing the 20-month limit. The policy will initially be applied to 2,000 asylum seekers detained in Holot. Seventeen of the detainees have already been told they have a month to accept deportation or be transferred to Sa’aronim. An estimated 43,000 Eritreans and Sudanese nationals currently live in Israel. According to international refugee law, they cannot be deported to their home countries due to the likelihood they would be subjected to persecution. Israel is a signatory to the 1951 Refugee Convention but has one of the lowest refugee recognition rates in the world - it has granted refugee status to only 200 asylum seekers in the last 60 years.